The CDC is not a government health advocacy organization. It is a corporation listed on Dun and Bradstreet and headquartered in the STATE OF GEORGIA, with strong ties to the pharmaceutical industry. Therefore, their recommendations are influenced by the ‘fiscal’ health of their corporation. Physician or institutional records are frequently reviewed by the STATE public health department, which is also a for-profit corporation listed on Dun and Bradstreet, who receives monetary compensation from the CDC to perform this function. Therefore, the state public health department’s recommendations and actions are influenced by the ‘fiscal’ health of their own corporation. The AMERICAN ACADEMY OF PEDIATRICS and the AMERICAN ACADEMY OF FAMILY PHYSICIANS are not health advocacy organizations. 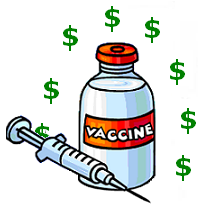 They are trade associations-corporations (listed on Dun and Bradstreet) that are head-quartered in the STATE OF ILLINOIS and the STATE OF KANSAS respectively, whose monetary compensation from the vaccine manufacturers contributes to the ‘fiscal’ health of their corporations. Physicians (who are intentionally misinformed by the CDC and Big Pharma and who cannot be sued for vaccine injuries) are paid higher reimbursement rates for each “fully vaccinated” child. This entry was posted in corruption, Government and tagged CDC, drug companies, immunity, public health, vaccine mandates. Bookmark the permalink. I watched the Alex Jones, David Eick, Jordan Maxwell, Jesse Ventura, and other conspiracy show shows on the Internet. I think the medical vaccinations are just another New World Order plot to inject everyone with a “kill switch” for future use, if anyone ever tries to rebel against the coming one world government and dictator. I am very machiavellian and that is how I would think if I was in their positions of power and I feared losing power. All people in high government, corporate, NGO, agency power positions are only allowed into those positions if they are NWO members, or soon to be NWO members..